In the southern part of the Salt River Range (Spring Creek). 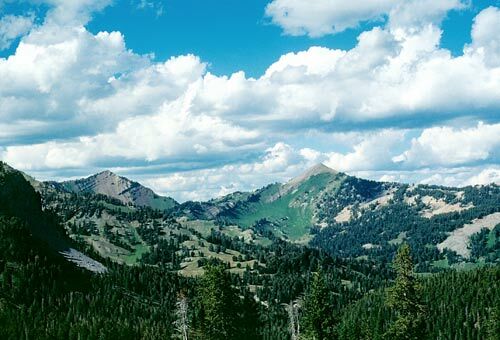 Bridger-Teton National Forest. Photo Copyright Ralph Maughan. Ugly and environmentally disruptive natural gas wells will not necessarily stay out on the high desert near Pinedale, WY. The Bridger-Teton National Forest embraces the highlands around Pinedale and north to Jackson Hole, and over half the forest is now available for leasing. This battle was fought once before in the late 1970s and early 1980s. Public opinion stopped most of the wells, although several were drilled, mostly in the Gros Ventre in Granite Creek, but several wells were drilled in the Mt. Leidy Highlands in full view of the Tetons. Intense opposition emerged to keep a well out of the headwaters of Cache Creek near Jackson, and that area was eventually included in the then new, Gros Ventre Wilderness. No oil or gas was developed subsequent to any the drilling. I still recall the utter arrogance of the industry at that time. As drilling interest waned, the national forest put in place numerous lease stipulations to protect the land and the wildlife, limiting where wells could be drilled and even whether the surface could be occupied (Note that oil and gas leases expire after 10 years if a well is not drilled on the lease.). Under the current Administration lease stipulations have turned out to mean little more than nice words on a piece of paper–the gas boys get the lease and the protective stipulations are waived when they want to drill, rendering them meaningless. Now the Jackson Hole Alliance and other groups want the scenic, wildlife rich, national forest taken off the table. Fight begins over BTNF energy exploration. By Nick Suarez. Jackson Hole Planet.